Out-of-the-box integration of OroCRM with Magento eCommerce platform provides a number of advantages, the most important ones being the ability to aggregate information collected from Magento-based stores and employ it in OroCRM. 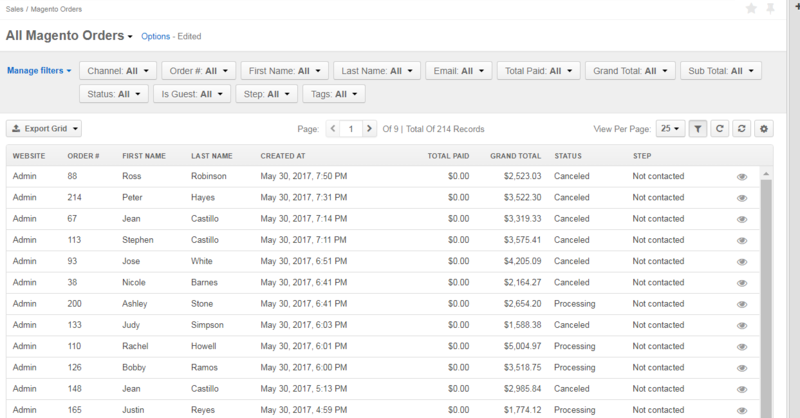 This means that shopping carts and orders created in a Magento store can be viewed and managed in your Oro application. Cart and order details, such as the number of items in the carts, their description, order purchase status, etc., are passed over to Oro in the course of synchronization with the Magento store, and can be used to aggregate valuable information for sales and marketing purposes. Moreover, you can convert shopping carts to orders from within your Oro application to save time and increase the revenue from your store. The following section of the guide will describe how to process carts and submit orders from your Oro application. Details from your Magento store will be synchronized into your Oro application as the result of the integration between Magento and OroCRM. To be able to work with carts and orders on the Oro side, please make sure that the integration is set up and activated, and two-way synchronization has been enabled. When this is done, Magento shopping carts and orders will be located under Sales in the main menu. Please, refer to your administrator if you are unable to locate them in your Oro application. Navigate to Customers > Magento Customers in the main menu. Click on the necessary customer to open their view page. Click Create Order in the top navigation menu on the customer page. At this point, if you leave the order placement procedure, a cart will be created in OroCRM. Navigate to Sales > Magento Shopping Carts. Click on the necessary cart to open its view page. Make sure that the status of such cart is Open. Click the Place an Order. 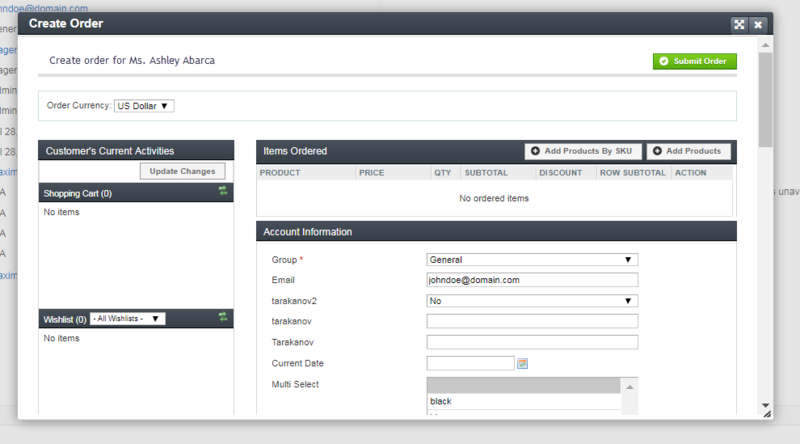 Enter the admin panel of your Magento shop and submit the order. Be careful not to confuse the cart status and step of the related workflow. 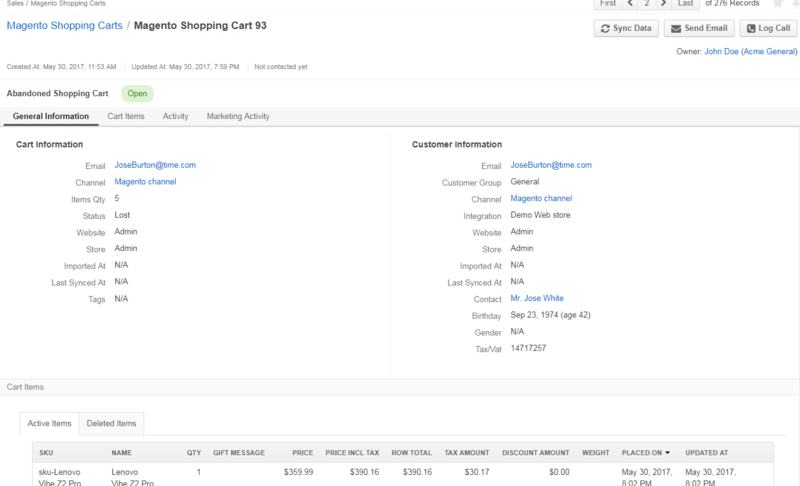 For example, a cart in the Contacted step can still have the Open status (items in the carts have not yet been bought). To view all Magento carts, navigate to Sales > Magento Carts in the main menu. Filter: Click to show filters per column. You can limit displayed items to those that match filtering criteria provided. Refresh: Click to reload the information about the items. If another user recently updated the item details, these changes are reflected upon the refresh. Reset: Click to roll back the view per page, filters and columns configuration to the default values. 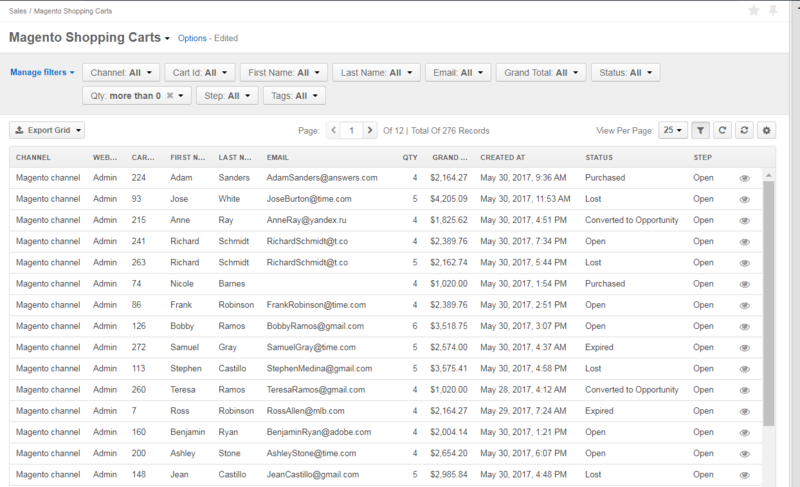 Manage columns: Open grid settings by clicking to see the list of columns that organize the item details. To reorder the columns, click and hold the column name, then drag it to the new location. Toggle on and off the column show option using the Show checkbox. To handle big volume of data, use page switcher, increase View Per Page or use filters to narrow down the list to the information you need. Clicking on the selected cart from the grid. Hovering over the more actions menu to the right of the cart and clicking . 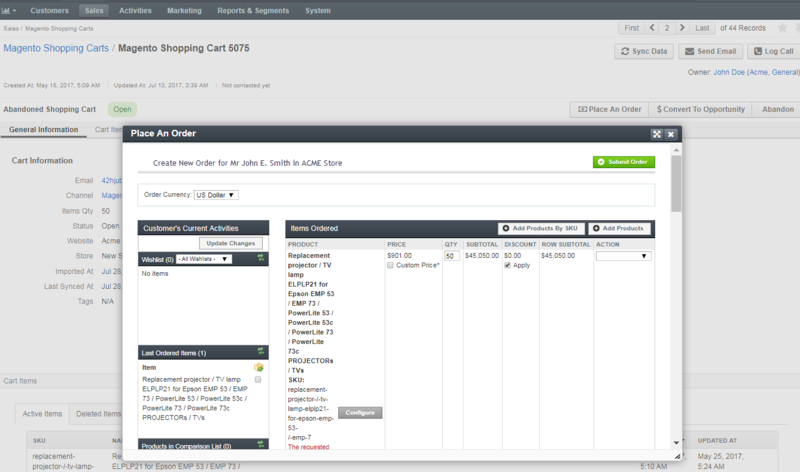 Navigate to Sales > Magento Orders in the main menu. Find the line with the necessary order in the grid and click on it. General Information section is for cart and customer details. Cart Items section lists active and deleted items from the cart. Activity section includes any activities related to the cart related to the order, such as attachments, calls, calendar events, notes, emails or tasks (if available). 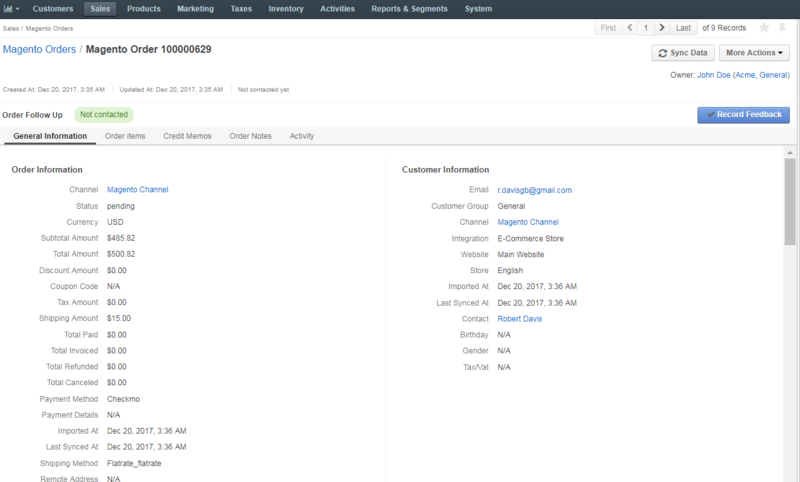 Marketing Activity section has any marketing activity records related to the Magento cart (if available). Sync Data to synchronize cart details. This will upload the latest information for the cart from Magento and back (as defined by the synchronization settings). Information for all the carts is updated once in a predefined period (default value is 5 minutes). However, it is strongly recommended to update a specific Cart record before you perform any actions with it. From the view page of a Magento customer. By converting a cart into an order. 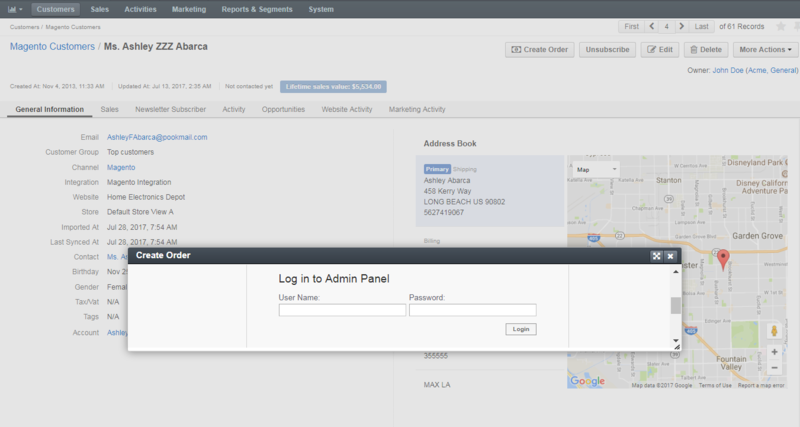 Enter the admin panel of your Magento shop. Fill in the details in the order form and click Submit Order in the top right corner of the form. If you do not complete order placement procedure, a shopping cart will be created. If you submit the order from the admin panel, an order will be created in OroCRM. To view all orders, navigate to Sales > Magento Orders in the main menu. To manage the columns displayed within the grid, click on the right of the grid, and select the information you wish to be displayed. Clicking on the selected order from the grid. Hovering over the more actions menu to the right of the order and clicking . General Information section is for order details, such as who created the order, which website it applies to, the customer’s shipping/billing addresses, telephone, etc. Order Items section has the list of products added to the order, and their details. Magento Credit Memos section has records of any credit memos related to the order. Activity section includes any activities related to the order related to the order, such as attachments, calls, calendar events, notes, emails or tasks (if available). Sync Data to synchronize order details. This will upload the latest information for the order from Magento and back (as defined by the synchronization settings). Under More Actions menu, you can log a call, add an attachment, a note, a task, an event, or send an email. Record Feedback on the order. Information for all the orders is updated once in a predefined period (default value is 5 minutes). However, it is strongly recommended to update a specific Cart record before you perform any actions with it.